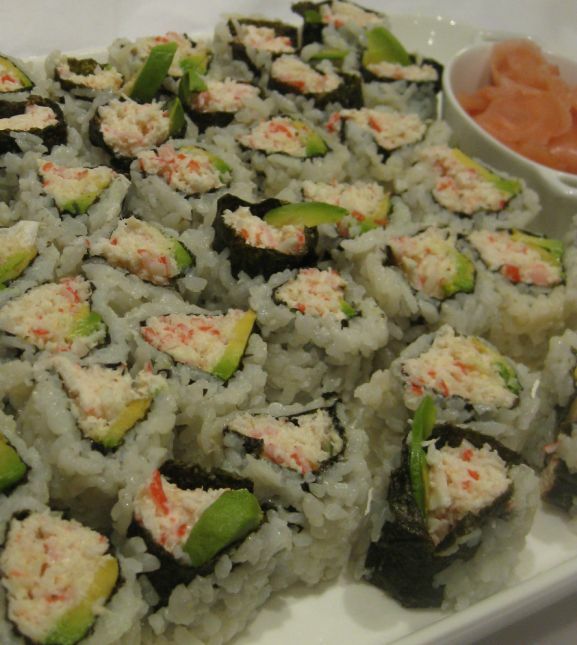 California roll is one of the most popular sushi rolls in the U.S. California roll is a kind of sushi roll, usually made inside-out, containing cucumber, imitation crab stick, and avocado. 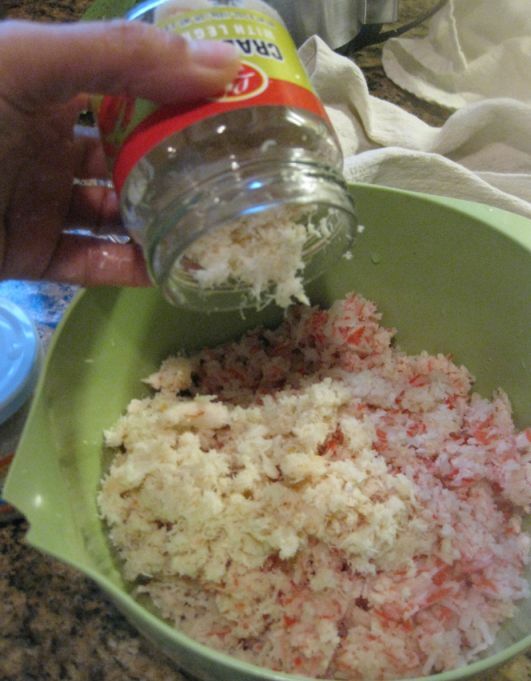 Sometimes crab salad is substituted for the crab stick, and often the outer layer of rice (in an inside-out roll) is sprinkled with toasted sesame seeds or tobiko (fish roe). 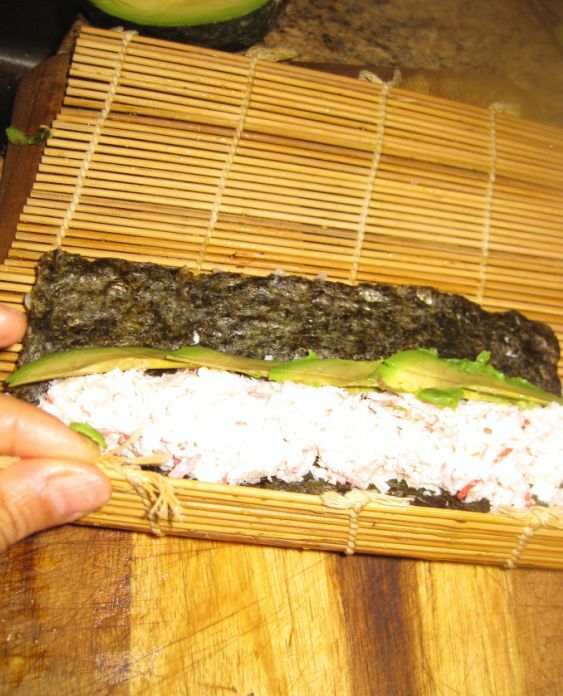 Since typical sushi rolls are rolled in dried seaweed, many people who aren't used to eat dried seaweed tend to have hard time to bite sushi rolls. 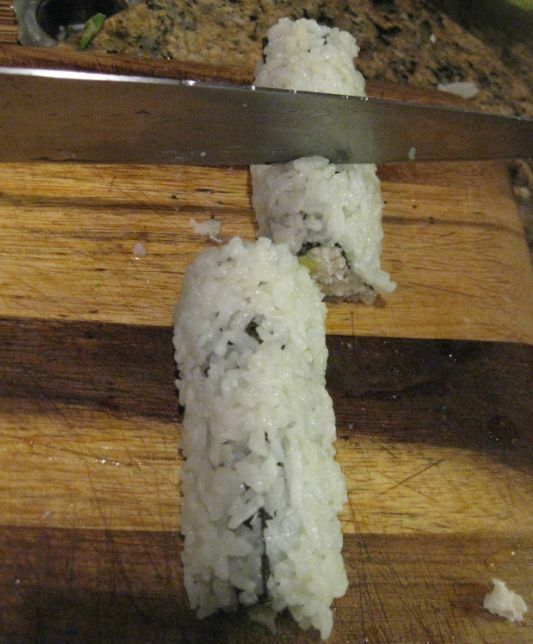 This is one reason that California rolls are made inside-out, so it's easy to bite. Tonight we are going to an Appetizers party and I am bringing this tray! 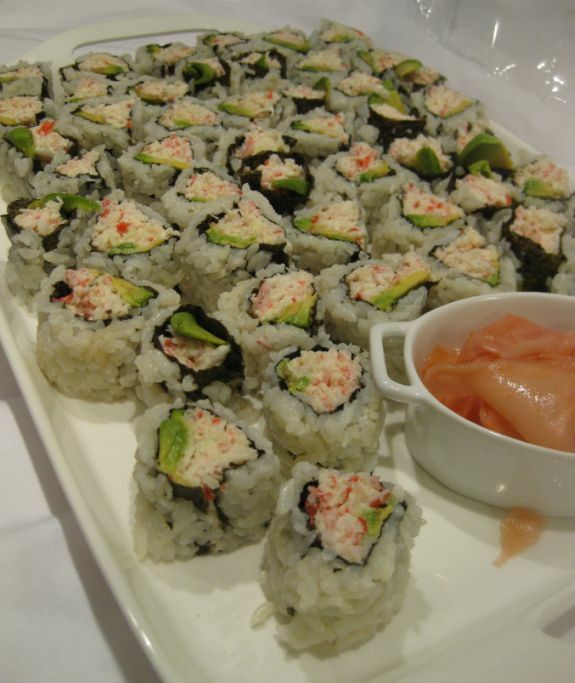 The kids requested that I bring some California rolls and that is what I am going to do. 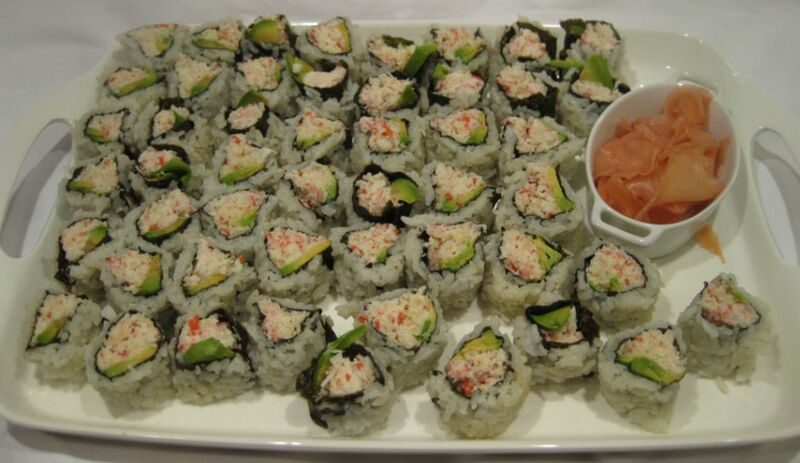 Close look at the California rolls. 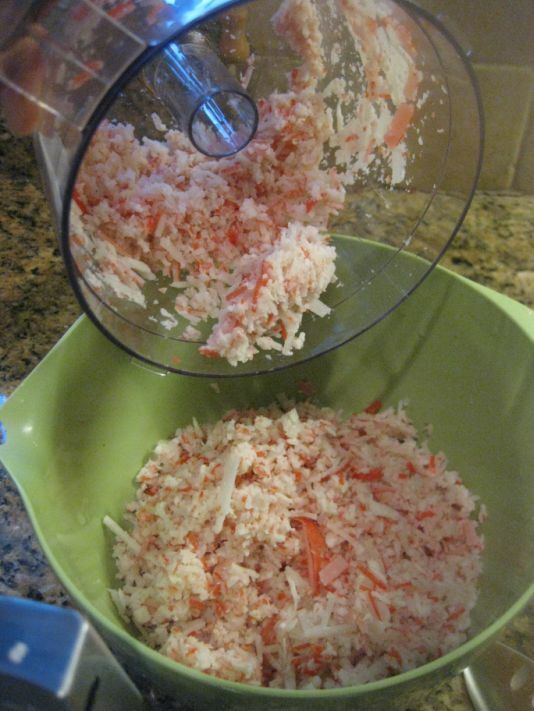 Pour the imitation crab into a large bowl and add the crab meat (make sure to dump out the water in the crab jar). Add the Mayonnaise and sugar. 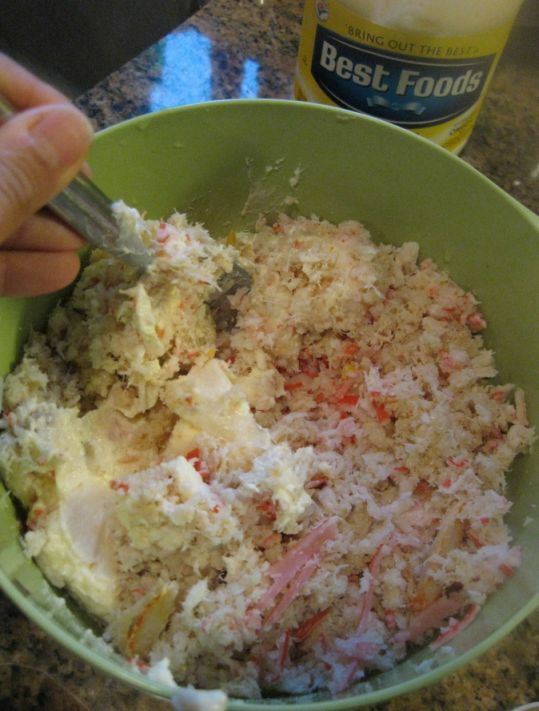 Taste the mixture and add more sugar if needed. 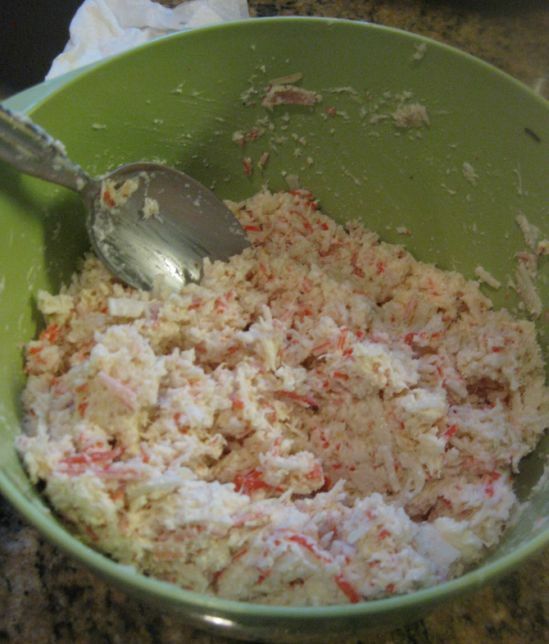 The crab mixture needs to be on the sweet side. 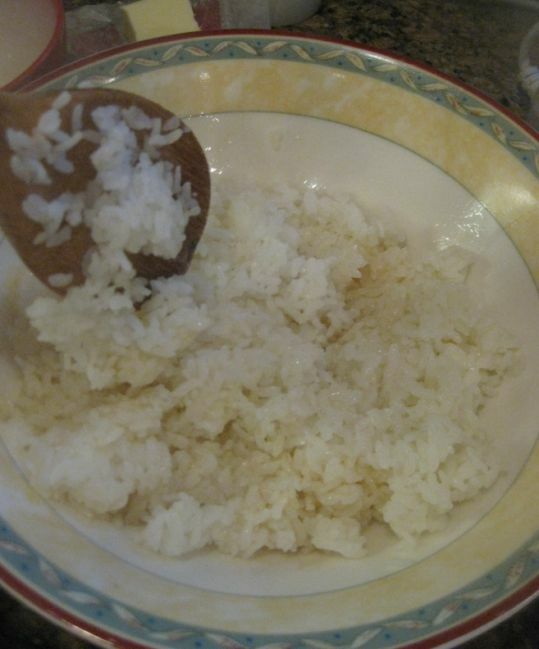 Put the rice in the saucepan or bowl and pour two times as much water to cover all the rice. Let the rice stay in the water for about 20 to 30 minutes. Pour out the water and fill with fresh water. Put the rice into the rice cooker pan and add water. 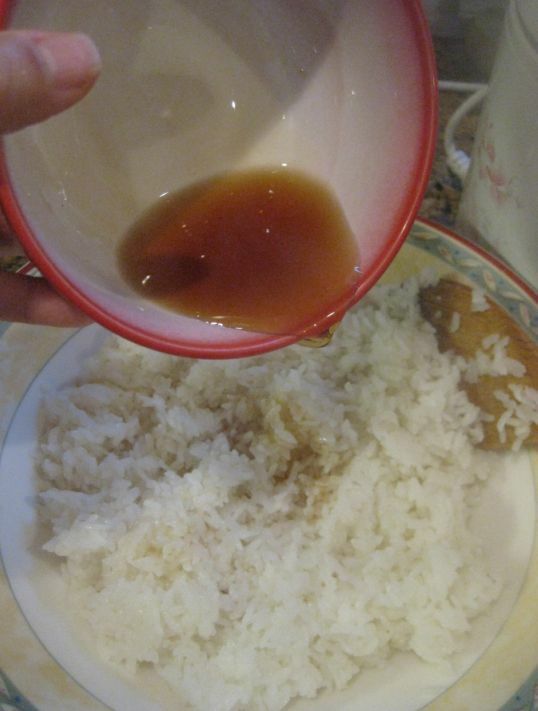 So basically it is two cups of rice on two and 1/2 cups of water. 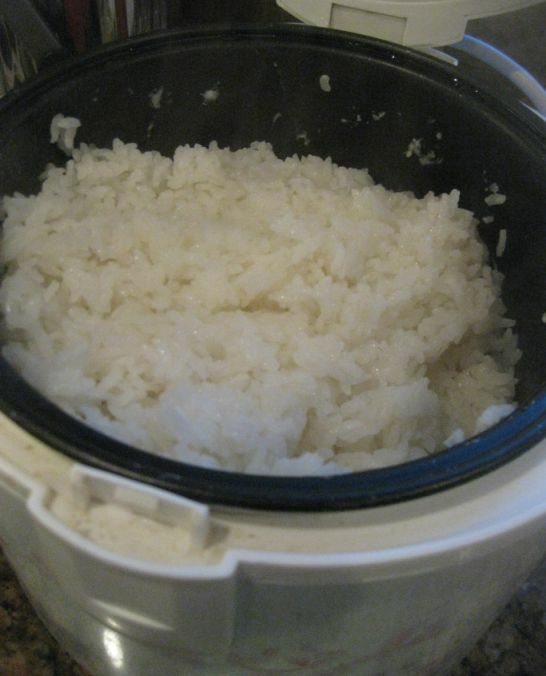 Press the button on your rice cooker and cook the rice. 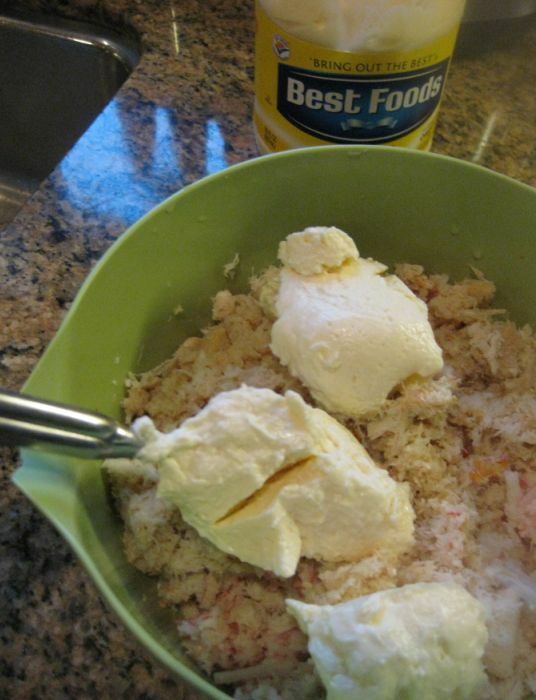 Put the rice into a large bowl and pour some rice vinegar over the top of the rice. 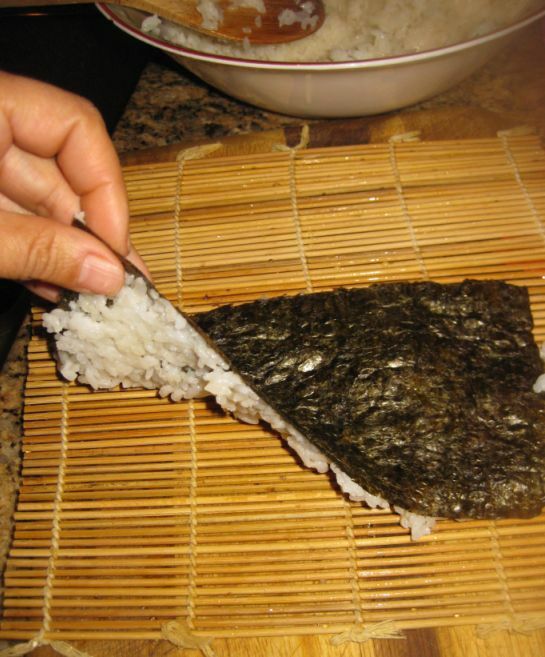 Cut the nori sheet in half and spread some rice on top of the nori sheet. Don't pile up the rice! 1/4 inch think will work. 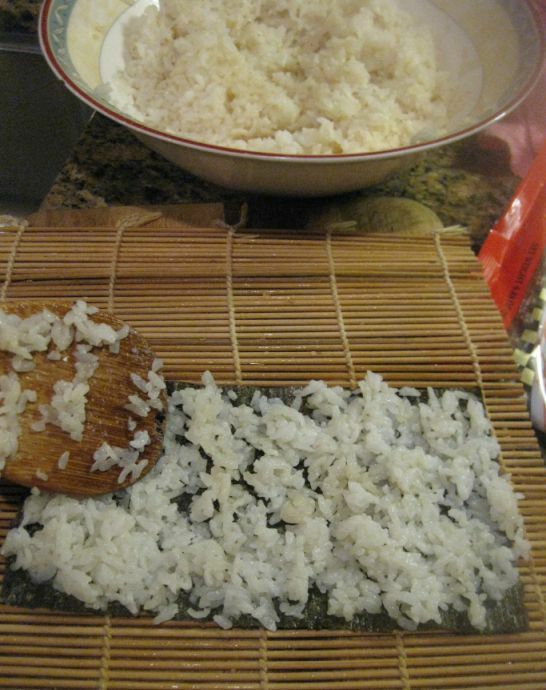 Turn the nori sheet so the rice is upside down. 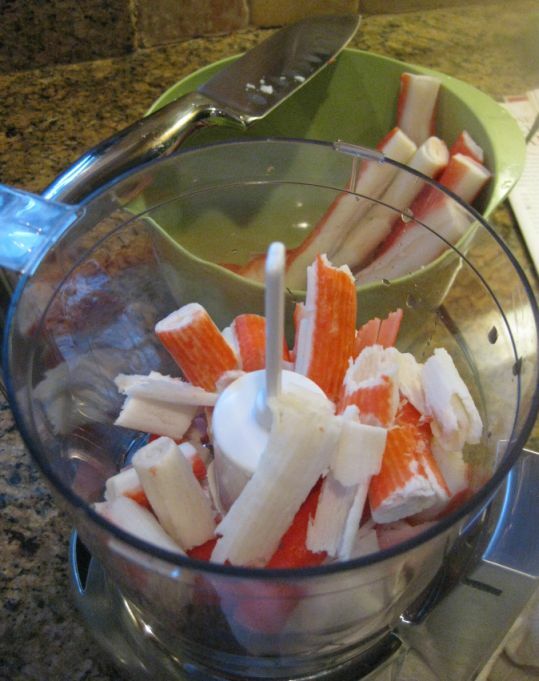 Spread the crab filling and then add a few slice of avocado. Roll the sushi roll by putting a bit of pressure. Remove the mat and cut the sushi into 6 pieces. Important Tip: Keep the knife very moist to prevent sticking, remoistening before each cut. Turn the pieces on end and arrange on platter.